To configure Take a Test on a single PC, follow the guidance in this topic. To configure the assessment URL and a dedicated testing account on a single PC, follow these steps. 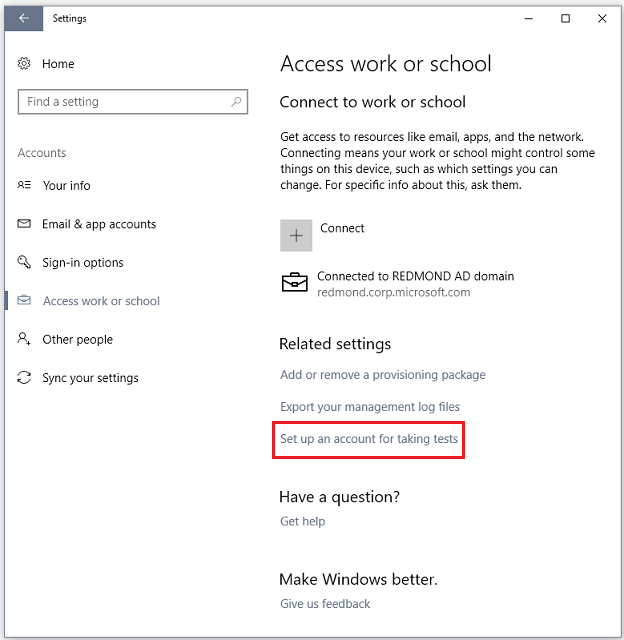 Sign into the Windows 10 device with an administrator account. Open the Settings app and go to Accounts > Access work or school. Click Set up an account for taking tests. 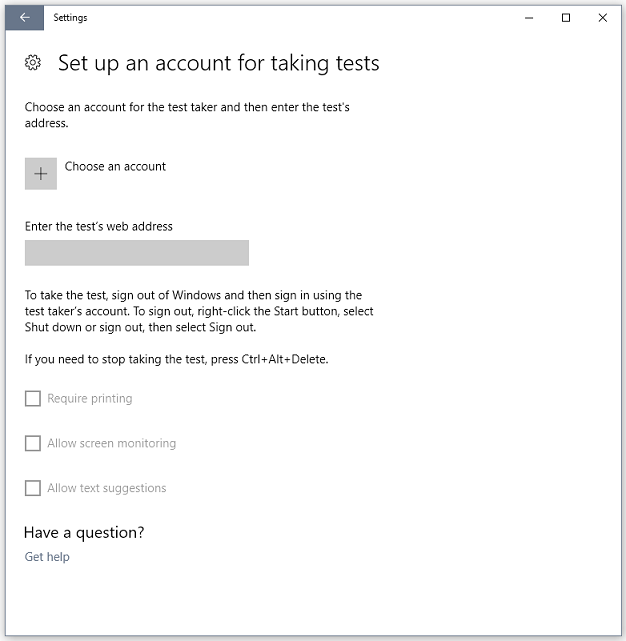 In the Set up an account for taking tests window, choose an existing account to use as the dedicated testing account. If you don't have an account on the device, you can create a new account. To do this, go to Settings > Accounts > Other people > Add someone else to this PC > I don’t have this person’s sign-in information > Add a user without a Microsoft account. In the Set up an account for taking tests, enter the assessment URL in the field under Enter the test's web address. Select the options you want to enable during the test. To enable printing, select Require printing. Make sure a printer is preconfigured on the Take a Test account if you're enabling this option. To enable teachers to monitor screens, select Allow screen monitoring. To allow text suggestions, select Allow text suggestions. To take the test, the student must sign in using the test-taking account that you created. Anything hosted on the web can be presented in a locked down manner, not just assessments. To lock down online content, just embed a URL with a specific prefix and devices will be locked down when users follow the link. We recommend using this method for lower stakes assessments. Create the link to the test. For this option, you can just copy the assessment URL, select the options you want to allow during the test, and click a button to create the link. We recommend this for option for teachers. To get started, go here: Create a link using a web UI. You can accomplish the same thing as the first option (using a web UI), by manually embedding a URL with a specific prefix. You can select parameters depending on what you want to enable. For more info, see Create a link using schema activation. Once the links are created, you can distribute them through the web, email, OneNote, or any other method of your choosing. You can also create shortcuts to distribute the link. For more info, see Create a shortcut for the test link. To take the test, have the students click on the link and provide user consent. If you enabled printing, the printer must be preconfigured for the account before the student takes the test. One of the ways you can present content in a locked down manner is by embedding a URL with a specific prefix. Once users click the URL, devices will be locked down. &requirePrinting&enableScreenCapture - Enables printing and screen capture; you can use a combination of &enableTextSuggestions, &requirePrinting, and &enableScreenCapture if you want to enable more than one capability. If you exclude these parameters, the default behavior is disabled. For tests that utilizes the Windows lockdown API, which checks for running processes before locking down, remove enforceLockdown. Removing enforceLockdown will result in the app not locking down immediately, which allows you to close apps that are not allowed to run during lockdown. The test web application may lock down the device once you have closed the apps. The Windows 10, version 1607 legacy configuration, ms-edu-secureassessment:<URL>!enforcelockdown is still supported, but not in combination with the new parameters. To enable permissive mode, do not include enforceLockdown in the schema parameters. See Permissive mode and Secure Browser API Specification for more info. On a device running Windows, right-click on the desktop and then select New > Shortcut. In the Create Shortcut window, paste the assessment URL in the field under Type the location of the item. Type a name for the shortcut and then click Finish. Once the shortcut is created, you can copy it and distribute it to students.